How Much Are Wooden Sleds Worth? Old wooden sleds can be valuable. Sled collector and expert Joan Palicia, author of "Flexible Flyer and Other Great Sleds for Collectors," stresses that "condition is everything" when it comes to appraising an old sled. In the 1860s, Henry Franklin Morton's Paris Manufacturing Company became the first large-scale manufacturer of sporting sleds in the United States. His sleds are prized for their hand-painted imagery and elaborate ornamentation. In good condition, these sleds can be worth anywhere from $300 to thousands of dollars for the more decorative ones. Collector Leon Weiss owns a Paris sled with a pastoral scene covering 85 percent of the deck, which he values at $15,000 to $20,000. In 1889, Samuel Leeds Allen patented the first "steerable" sled, the Flexible Flyer. It was extremely popular, and sold 10,000 sleds a day at its peak. Because they were so common, Flexible Flyers are not usually worth as much as the Paris sleds. Collectors will pay from $25 to $1,000, with mint-condition sleds fetching the higher prices. 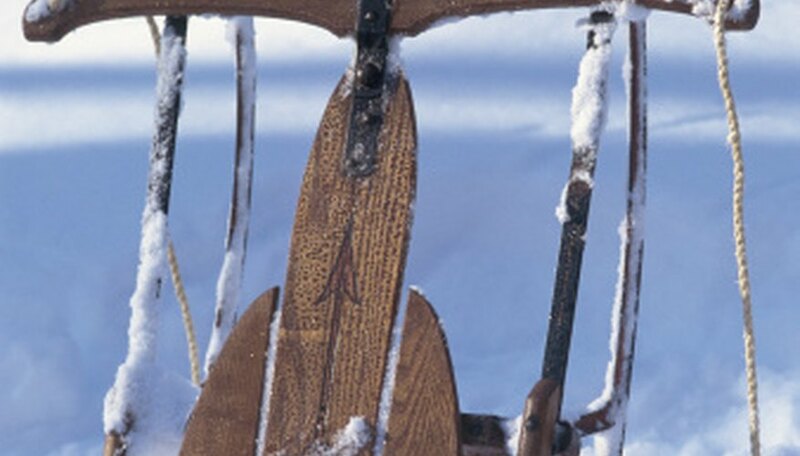 These wooden sleds were produced from the 1930s to the 1970s. Flexy Racers were made to be used without snow on the ground. The body was designed like the Flexible Flyer, but instead of metal runners, it had wheels to propel you down the hill. They are valued at $3 to $700 in 2010. The Garton Toy Manufacturing Company produced sleds from 1879 to the 1920s. The decks of these sleds were a beautiful red; they even came to be called "Garton Reds." This signature mark is popular with collectors in 2010, and these sleds are valued at $500 and up. Marisa Hankala began writing professionally in 2010. She writes for eHow and Answerbag, with expertise in art, film, family and relationships. Hankala holds a Bachelor of Arts in filmmaking from Fairleigh Dickinson University. What is the Value of Vintage Schwinn Bicycles?